Nazareth Christians Warned Against ‘Slandering’ Allah – I Am Not Ashamed Of The Gospel Of Christ! As Christians of every stripe in Jesus’ hometown of Nazareth begin to again take a real stand for their faith, local Muslims are warning them not to overstep the boundaries of their traditional place in the Middle East hint: they must remain dhimmis, or second-class.A large billboard hanging at a central point in Nazareth features a picture of an Israeli stop sign, along with the English translation of a verse from the Koran cautioning Christians and Jews to speak only the “truth” regarding Allah.The poster and Koran 4:171 reads:”O people of the Scripture Christians! Do not exceed the limits of your religion. Say nothing but the truth about Allah The One True God. The Christ Jesus, Son of Mary, was only a Messenger of God and His word conveyed to Mary and a spirit created by Him. So believe in God and His messengers and do not say: ‘Three gods trinity’. Cease! It will be better for you. Indeed, Allah is the One and the Only God. 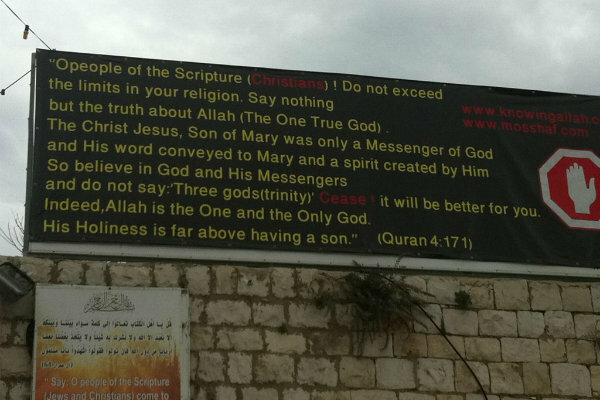 His Holiness is far above having a son.” Nazareth Christians Warned Against ‘Slandering’ Allah – Israel Today | Israel News. My Comment: Nazareth was made a World Heritage Site in 2012, and it gave control to the Palestinians. Read here. Just think when the peace deal goes through what freedom we will have in Jerusalem at our Holy Sites there. We do not worship the same God. And they will restrict any freedom for Christians or Jews to worship. [Jhn 10:28-30 KJV] 28 And I give unto them eternal life; and they shall never perish, neither shall any [man] pluck them out of my hand. 29 My Father, which gave [them] me, is greater than all; and no [man] is able to pluck [them] out of my Father’s hand. 30 I and [my] Father are one. Watchman’s Alert: U.N. Aligns Itself With Palestinians | 'I Am NOT Ashamed of the Gospel of Christ!